I’m just curious… Wanting to know if I was mentally abused as a child or is it just me over reacting.. As far back as I remember, is that my mother and father always argued about money every time my dad was home from work. I would wake up… In the middle of the night, listening to my mother screaming at my father… I crept out of bed and watched them screaming and fighting. I witnessed my mother on many occasions slagging into my dad’s eyes and face while giving him the finger, telling him to sit on this and rotate china. And then dad would smack her in the mouth…pull her hair and give her a bloody mouth or blood nose, while I’m standing in the door way crying and screaming… Please daddy don’t hurt mummy. There behaviour for all them years has really affected my life and as far back as I can remember, my father has always told me that he is riddled with cancer. I am over 40 years old now and he to this day now he is still telling me that he is dying or cancer. Apparently, according to him, he has bowel cancer, prostrate cancer, emphysema, lung cancer, tumor on the brain., arthritis, deaf in both ears… Apparently he has had three massive heart attacks one after the other, according to him. I’ve put up with all his lies that I actually believed years ago that he was telling the truth.. But at 30 years old I finally realised that he has been lying to me the whole time. I don’t go and visit him no more because I don’t know what to believe about him anymore. My mother has 5 children, 8 grandchildren and one great son from my daughter. My mother visits her other 4 children and 4 grandchildren, but doesn’t talk to me or visit my 4 children and grandson. Honestly, I believe that my parents have mentally abused me, and now they’re trying on my children… What do you think? Do you think I’ve been abused?? Or am I over reacting.?? Yes, I do think you have been abused… mentally, psychologically and emotionally. If your father is not sick but trying to make you believe he is, he is manipulating you emotionally and playing the victim. YOU are actually the victim…as a child, you had to watch helplessly as your parents fought and now you feel still helpless as your father makes you look like a terrible person for not visiting him now to your adult children. Your mother is too busy with your siblings and their families. 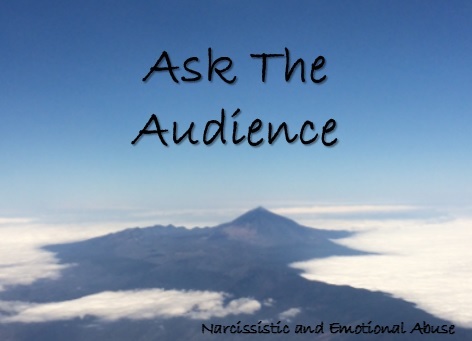 Sounds like your emotional needs are being neglected by your family…and they probably have been for a long time. I don’t think you’re overreacting. You shouldn’t have to happily subsist on the scraps of people’s affection and live with inconsistency and lies…if that indeed is the case. Narcissists are like children. You needed parents, but if you end up with narcissistic parents, they’re self-absorbed, tantrum throwing, unempathetic, soul sucking, “victims” and you don’t get the emotional consistently you need. It’s all about them!! You’re not overreacting… They’re underloving you because they are incapable of giving you the type of love and support you need. Please don’t feel bad for them. They don’t feel bad for you. In their way, they “love” you, but they don’t really understand love at all…That’s a problem. Love is all for them…not for you. It’s a pretty unequal relationship, because it isn’t a relationship. You’re there to serve them… they’re to receive your service WITHOUT gratitude. The sooner you start taking care of your own needs and decide to “write them off” as loss causes, the better you’ll feel. I’m not trying to be mean. I’m trying to be honest. I really wish you so much luck. I’m going through the same thing, myself! !